I have fallen behind on my blogging this week and my last post was a pitiful summation of bizarre events that occured while I was staying in my old family house. My computer stopped working so I had to post from my iphone. My pictures were blurred and everything went haywire. My grandmother died yesterday before we made it back to see her and the only thing that's gone really well this week is my reading, which has gone at breakneck speed. In the spirit of my flight of fancy, I will tell a story I found in my favorite new book, There's Something Under the Bed. Dolls scare the hell out of me so this story gave me nightmares. This is the story of an over sized Raggedy Ann doll named Annabelle. 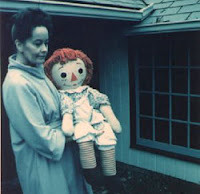 Annabelle was a gift given to a young nurse named Donna by her mother. It wasn't long after Annabelle was given to Donna that Donna began to notice Annabelle moved about the apartment on her own. Donna and her roommate, Angie, began to notice that they would leave for work and when they came home the doll would be laying on the bed in a different position. The women started arranging the doll purposely in one position and they would find it with its arms crossed or legs moved. This went on for some time and after a while the doll became more active. It would change rooms. Once, they even found the doll kneeling. This is a position that is impossible for a raggedy anne doll on its own. Sorry for the loss of your grandmother. !! I think there was an event last year ... maybe Halloween ... where Lorraine and her nephew, John Zaffis, took artifacts from the museum, including Annabel, on the road with them. Which surprised me, because ... well ... obvious. But I just figured they must know what they are doing. Someone went to the event and there was some weird photo stuff that went on around the doll. The photos were posted somewhere. I think the event included the cast of Paranormal State. It may have appeared on their site. I'll rack my brains and surf a bit and see if I can find the posts. I am pretty skeptical, but the pictures and the anecdote impressed me. My friend who was a soul rescuer/medium told me that often times the more negative, non-human entities will masquerade as something innocent. ie. on quija boards, which are very prone to contacting things at the lowest levels. He always cautioned that people be very much on their guard whenever communicating with entities ... just as you would not assume a stranger who appears at your door at night is who they say they are and you would not automatically invite them in ... same thing with the spirit world. He did say that if the entity was negative, no matter what the deception, they always trip up and reveal themselves sooner or later. You just have to be saavy. First of all, sorry for the loss of your Grandma. Second of all, another reason to be terrified of dolls! The story of the doll is chilling. I used to have a doll just like that and I was sure she was haunted in some way. I've always thought Raggedy Ann had an evil look about her. Palemother... wow. Thanks for the info. The more I hear about the doll the scarrier she becomes. I've always been afraid of ouija boards for the reasons you list. I like to know who I'm talking to and I don't need any dark spirits in my life. Thanks to everyone for the condolences. so sorry for your loss, my condolences to you and your family. My father has a doll in his bedroom that is antique. It's more of a plastic-type, but certainly not of ceramic. Every time I would go in his room, I'd have to pass by that doll, both going in to and out of his room when I went on a 3-week visit. It's face was partially squished in *which made it even creepier to look at and go by*. Every time, I got this fearful, and the urge to flee feeling. My heart would literally race as I passed by the doll. That stupid thing has been deemed via his will to go to my oldest daughter. But the thing is NOT coming in to my home. I'll toss it, sell it, or donate it before it EVER comes in to my home (when the time comes). Oh no! Nothing worse than being willed the one thing that terrifies you. All dolls scare me. I'm just lucky I don't have any daughters. Very sorry for the loss of your grandmother. I wonder what would happen if you left this doll in the same room with the painting of "The Anguished Man".. would they get along? or would they fight with one another?????????? ?